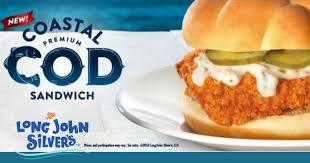 On Friday July 1 visit your local Long John Silver's and try a free Coastal Cod Sandwich Sample. Offer available when you dine in between 11am and 2pm at participating locations. Click here to see if your local Long John Silver's is participating.